Muhammad and his followers endured persecution in Mecca and then in 622 CE they then migrated to the nearby town of Yathrib, later known as Medina, where the people accepted Islam. This marks the “hijrah” or “emigration” and the beginning of the Islamic calendar. Muhammad established an Islamic state in Medina based on the laws revealed in the Quran and the inspired guidance coming to him from God. Eventually he invited other tribes and nations to Islam. Muhammad and many his followers returned to Mecca in 630 CE. He entered the city peacefully, and eventually all accepted Islam. The prophet then cleared all idols and images out of the Kaaba. Muhammad Died in 633 C.E. 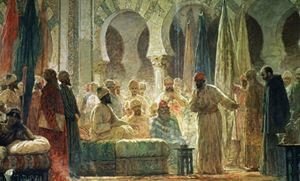 The Muslim community, upon Muhammad’s death, elected his father-in-law and close associate, Abu Bakr, as caliph, or successor. Abu Bakr’s daughter Aisha was married to Muhammad when she was six years old and he consummated his marriage when she was nine. She remained with him for nine years until his death. Muslims entered the area north of Arabia, known as “Sham,” including Syria, Palestine, Lebanon and in Iraq 638 CE. They invaded Egypt in 641 CE, enriched by their conquests and routed the Byzantine army. Thus, began the destruction of Christianity in Egypt then one of the centers of Christianity. Muslims considered their conquest as the liberation of subjugated people, since in most instances they were under oppressive rule. There was no stopping this vicious wave of Islam as they murdered, raped and plundered across North Africa in 655 CE and into Europe, all in the name of peace. Imam Ali was killed in 661 CE bringing an end the rule of the four “righteous caliphs”: Abu Bakr, Umar, Uthman, and Ali. This also marked the beginning of the Umayyad rule.